Why Choose a Professional Carpet Cleaning Technician? Looking for Carpet Cleaning in London? A carpet can tell you a lot about your life. It will have its own tale to tell and the marks and stains are all part of the storyline. But the muddy footprints, food stains and accidental spillages are not always a story that you want to be told, so that’s where a carpet cleaner comes in. There are a number of choices you can make when your carpet needs a good clean. You can hire carpet cleaning equipment from most local hardware outlets and put your own cleaning skills to the test, or you can used a fully trained professional carpet cleaning service. Why choose a professional carpet cleaning service? In the current financial climate, you might think that you would be save to go with the first method of hiring some cleaning equipment and doing the hard graft yourself. However, the decision is not as straightforward as you might think. The first major benefit of a professional is that they will know exactly what they are doing with the equipment. You know how it is: you get a new PC and your spend hours sifting through the manuals that as thick as a concrete slab, only to find out you haven’t got the right graphics card to run the game you’ve been looking forward to all day, well it’s the same with a carpet cleaner. When you’re paying to hire something by the hour, you don’t want to be spending the first half of the day reading up on how to use the thing, and then the other half working out which chemicals you need to use to shift that stubborn stain. Surprisingly, you can also save on cost by using a professional to clean your carpets. Of course you would think that hiring equipment is going to be cheaper because you are covering the cost of labour yourself, but it is not as straightforward as you would believe. What you may not have been aware of is the cost of the chemicals that are not usually included which will bump up the price of any hired equipment. Add to that the fact that there will be wastage on the chemicals, and it all starts to mount up. Perhaps the most inconvenient thing about cleaning your own carpets is the emptying out of the room and making sure no one walks through the place before it’s dry, and of course it takes a long time to dry, which only adds to the hassle. With a professional carpet cleaning service, their superior equipment and technique means that your carpets could be dry with only a few hours, rather than an overnight wait that may be in store when your do it yourself. So in summary, calling in a professional to clean your carpets can save both time and money. It makes sense to watch the pennies, and the extra time can be used to put your feet up and admire your lovely clean carpet. 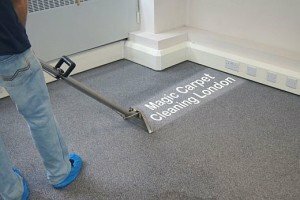 Just make sure, when you make the choice of a professional, make it the right choice of professional, and call Magic Carpet Cleaning on 0208 861 0979!